Restaurant style Paneer Butter masala recipe with step by step picture- In this post, you can learn how to make North Indian, restaurant style Paneer butter masala at home. I tried this recipe from Nags Space. I made slight changes in the original recipe by simplifying its cooking procedure & the list of ingredients.It came out excellent in taste .Thanks a lot Nags. Its a quick and easy to make recipe.So I make it very often for Raksha’s lunch box. 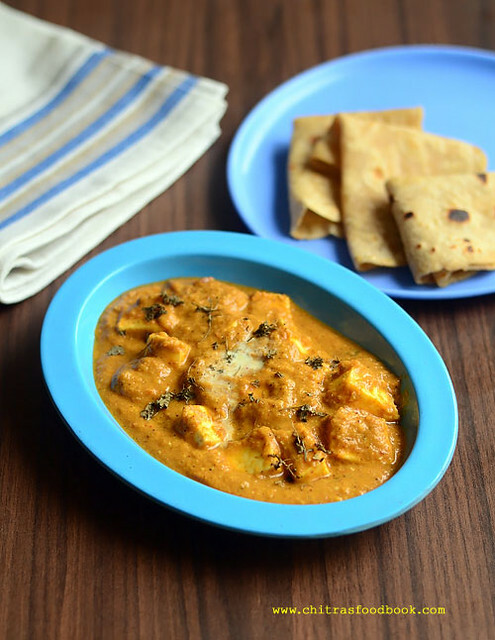 She loves the combination of soft chapathi with paneer butter masala more than other gravies.The addition of cashew paste, milk and fresh cream makes it so rich. You can make this gravy without onion and garlic too. I am sure it tastes great. I want to treasure this recipe in my blog for future reference.So here comes the yummy restaurant style Paneer Butter Masala recipe. Do try this recipe at home and let me know your feedback ladies . In a kadai, heat oil( use butter for rich taste) and saute the onion till transparent.Add Ginger&garlic paste,saute till its raw smell goes off.Now add the red chilli powder, dhania powder , garam masala powder. Saute in low flame. Make sure you don’t burn them. Let the mixture cool down completely. To the mixture, add the blanched tomato and raw cashews. Grind everything to a smooth paste adding required water. Heat oil ( or butter) in a kadai and saute the ground paste till thick. Add tomato ketchup, sugar and salt. Mix well and boil the gravy till oil starts to float on top. Add the boiled milk. Mix well and check the taste. Let the gravy boil for few minutes. Gravy gets a nice orange shade. Lastly add the crushed kasoori methi, paneer cubes.If the gravy is too thick, add more milk. Mix well. Add fresh cream at the end and switch off the flame.Check for spice & salt. If its too spicy add some more milk and vice versa. Serve with roti !! Use butter instead of cooking oil for rich taste & flavor. Instead of grinding cashews along with tomato, onion mixture, you can grind it separately and add it along with milk. You can also use almonds/badam in place of cashews. But cashews are the best ! You can peel the skin of blanched tomato, grind it to a puree and add to the gravy. But I ground it with onion masala. Adjust the quantity of chilli powder and dhania powder as per your taste. Adding kasoori methi gives the perfect restaurant style taste.So please don’t skip it. 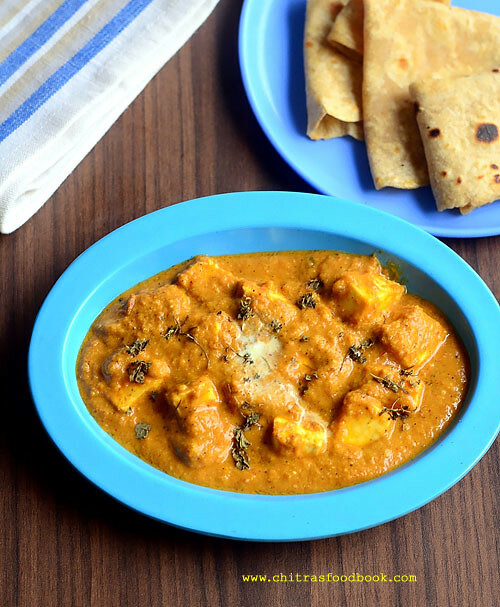 Yummy Paneer Butter Masala is ready to be served hot with Chapathi , Naan. I have been wanting to make this from the day when Nags posted it, but i have to make my paneer first. This looks really yummy too. Cashews,milk,cream,butter...what not to make it yummy and delicious! Always love this! The gravy looks superb. So rich and creamy. Truly restaurant style Chitra. The gravy looks just like those we eat out! YUmmy and rich gravy...looks tempting and delicious. Hey, this is my kids favorite and I make this quite often, love ur recipe too. It looks so creamy and YUMMM..Super dish simply love it !!! Chitra, this looks too good.Guess will try out soon! i have linked to you in the tried and tasted section. thanks! 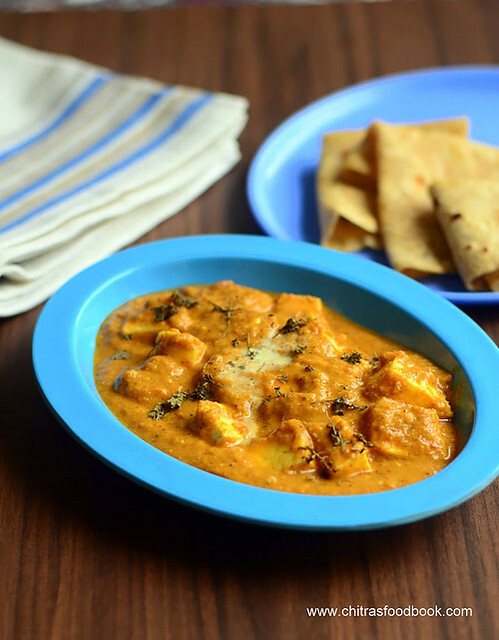 Beautiful and irresistible paneer butter masala, very tempting..
My grand children love paneer butter masala.I will surprise them with your recipe this week end.Thanks a lot. Very nice dish.. mu fav dish.. looks delicious..
the gravy looks so rich and flavorful...mouth watering. Looks rich, creamy and luscious! Looks rich, perfect dish for guests. Just made it for dinner. The recipe turned out tasty!Thank you for the Quick and easy recipe. rich, yummy perfect for a get together..
am going to try it today..